It’s expensive, but Samsung’s heavyweight in the smartphone division boasts a wide range of tempting features. We were particularly impressed with the dual cameras, slick performance, and S Pen functionality in our Samsung Galaxy Note 8 review. As great as it is, Samsung’s biggest and best is not flawless. We’ve been digging around forums and comments to find the Galaxy Note 8 problems you need to know about and unearth advice on how to work around them or fix them. We’ve seen a handful of reports at the Samsung forum and at the XDA developers forum about unresponsive screens and phantom touches. People are finding that they can’t swipe down the notification shade sometimes and at other times touches are registering without people touching the screen. Using the S Pen seems to work for most people, even when finger taps and swipes don’t. Make sure your fingers and the Note 8 screen are clean and dry. If you have a case or a Note 8 screen protector, it could be interfering with the touchscreen. Try restarting your Note 8 by holding down the power button and tapping Restart. If the touchscreen is unresponsive, then hold down the Volume down and Power keys together for a few seconds until the Note 8 reboots. It’s possible an app is causing your problem. You can test this by turning the Note 8 off. Hold down the Power key and tap Power off. Once it’s off, press and hold the Power key until you see the Samsung logo. Let go of Power and press and hold the Volume down key. You can let go when you see Safe Mode on screen. If the problem is gone in safe mode, then you know an app is the cause and you just have to track it down. Either uninstall one by one and test, or factory reset and install selectively. You just hold down Power and tap Restart to get out of safe mode. We think it’s worth trying a cache partition wipe for this problem. Hold down the Power key and tap Power off. Press and hold the Volume up and Bixby keys, then press and hold the Power key as well. Let go when you see the Android logo. Use Volume down to highlight wipe cache partition and Power to select it. Highlight yes with Volume down and then select with Power. When it’s done tap Power to Reboot system now. Your penultimate option is to try a factory reset, but make sure you back up everything first. You’ll find the option in Settings > Backup and reset > Factory data reset. If your screen is unresponsive you can press and hold the Volume up and Bixby keys, then press and hold the Power key as well. Let go when you see the Android logo. Use Volume down to highlight wipe data/factory reset, then use Volume down to highlight yes and Power to select it. You’ll have to set your phone up as new. If nothing has worked, then you may have a hardware fault. It’s time to contact your carrier, retailer, or Samsung and ask about a replacement. This is a common complaint with smartphones and there are a lot of possible causes. We found the Note 8 battery life to be good in our review, lasting us a full day between charges even with medium to heavy use, but not everyone has had the same experience. There are threads on XDA Developers forums and Android Central forums bemoaning the battery life. There are a lot of different ways to make your cell phone battery last longer, but they tend to involve turning things off. Your screen is the biggest drain on your battery, so decreasing your screen timeout and lowering your brightness can help. The Note 8 does also have a Power saving mode. Go to Settings > Device maintenance > Battery and you can configure it and toggle it on. We recommend tapping Mid for medium power saving mode because it doesn’t impair your Note 8 too much. You can also customize precisely what it does to ensure it isn’t annoying. If you scroll down further in Settings > Device maintenance > Battery you’ll see the App power monitor and the Save power button, which can be used to limit how much battery life apps are chewing through when they’re not open. If you see any really greedy apps in here consuming a large percentage of your battery, then consider uninstalling them. The always on display is inevitably going to be an extra battery drain, so you could turn it off via Settings > Display > Always On Display. We like it, but we’ve gotten into the habit of turning our Note 8 face down when we don’t need it, so the display doesn’t come on. Snag yourself one of the best portable battery chargers. Uninstall any apps you aren’t using and make sure the rest are up-to-date. Some apps that can’t be uninstalled can be disabled. Open the Play Store, tap the three horizontal lines at the top left, and tap My apps & games, then Update all. You should also look under Settings via the three horizontal lines at the top left in the Play Store and decide whether you want Auto-update apps to be on. Generally, we think it’s a good idea, but if you have a lot of apps, then the auto-updates can be a definite drain on your battery. When we’ve experienced major battery drain problems with Android phones in the past, it has often been down to something in the backup we restored. If you choose to automatically restore settings and apps from a previous phone, it can lead to mysterious battery drain issues that are hard to track down. A factory reset and then a fresh install of your apps can drastically improve battery life. Another thing that can cause mysterious issues is using a MicroSD card from an old phone in your new Note 8. We recommend sticking it in a computer or laptop, backing up the content, reformatting the card afresh, and then only loading on the files you really need, before putting it into your Note 8. There’s a slight risk with OLED smartphone displays that you’ll end up with permanent image outlines or patches on your screen, most commonly a faint ghost of the navigation buttons. The risk is increased if you have the same static icons on the screen for a long time and you crank your brightness up high. A few forum posts have popped up complaining about this issue on the Note 8. Don’t waste your time with apps that claim to fix screen burn-in, you need to contact Samsung about this one. A hardware service can fix this issue. You can take your Note 8 into a Samsung service center or call Samsung support to arrange it. The Note 8 should charge wirelessly on any Qi wireless charging pad, and it will charge a bit faster on supported fast charging pads. For some people, however, it seems to be refusing to work. There are posts at the Samsung forum, the XDA Developers forum, and the Android Central forum. It’s always worth turning your Note 8 off and on again when you encounter a problem. Hold down the power button and tap Restart, then test again. That may at least temporarily get it working again. While Galaxy Note 8 cases are a smart idea to protect your phone, they can sometimes interfere with wireless charging. If you’re using a case, then remove it and test again. Some wireless charging pads are fussy about your placement. Try moving the Note 8 around. If you’re using a vertical stand, try turning the Note 8 from portrait to landscape. Make sure you’re using the cable and adapter that came with the wireless charging pad or with your Note 8. Test on another wireless charging pad if you’re able to, just to make sure the pad itself isn’t faulty. If your wireless charging is working, but you can’t get it to charge faster, then look in Settings > Advanced features > Accessories and make sure Fast wireless charging is toggled on. Experiencing a frozen Samsung Galaxy Note 8? You’re not alone. Galaxy Note 8 users around the world are complaining of phones freezing up on Samsung’s community forums. These reports first appeared shortly after the release of the Note 8, but have been growing in numbers over the past few weeks. 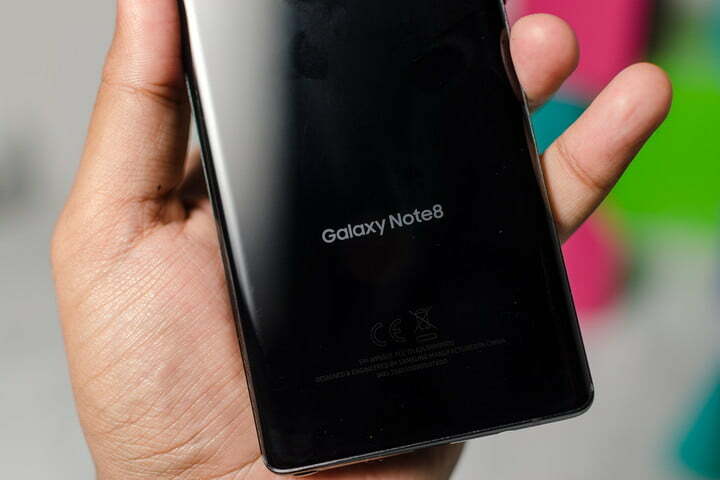 The problem does not appear to be tied to a specific model of the Samsung Galaxy Note 8, though Android Police reports that SM-N950U units on U.S. carriers, unlocked European (SM-N950F), and dual-SIM (SM-N950D) models have been listed in the forums. An exact cause is not known, users have noticed the phones tend to freeze when using the Contacts app or other apps that pull information from the Contacts app, such as the dialer, messaging apps, and more. Several people suggest the issue stems from downloading the Google Contacts app, which may be conflicting with Samsung’s Contacts app, though this has not been confirmed. A hard reset is the primary workaround for a frozen Galaxy Note 8. A hard reset will take several minutes and will completely erase all information on your phone. To perform a hard reset on your phone, press the Volume up, Bixby and Power buttons at the same time. In 30-45 seconds you should see the Android Recovery Menu. Use the Volume down button to select the Wipe data/Factory reset option and press the Power button to select it. An alternative option (albeit more time-consuming) is to allow your battery to die and then recharge. While this will take a lot longer, you will likely not lose any data if you regularly backup your phone. For people who are experiencing frequent freeze-ups, Android Authority is reporting that you can contact Samsung support to arrange an “evaluation and repair.” Samsung’s U.S. support number is 800-726-7864. Users outside the United States can check out Samsung’s country-specific site to find relevant support options.